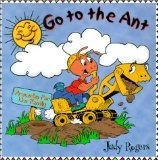 Sunday Snippet: Go to the Ant. It is a collection of the most delightful songs, based on the book of Proverbs and written by Judy Rogers. If you would like too you can take a look at the lyrics to all the songs here. Songs about the hard working ant as apposed to the sluggard, the school of the fool and the tongue which can cut like a knife. We like these songs so much and we all know the words off by heart maybe because at first we had the tape and we literally listened to it until it wore out and then we discovered the cd and we have listened to that ever since. The music is fun and the songs are catchy but not in maddeningly childish kind of a way. So often a cd that is marketed as a kids cd can drive the associated adults half barmy. This one is so lovely that I don’t mind listening to it for the se7enth bazillionth time. In fact, I will even enjoy it – again! There are two coloring books associated with the Cd and here are some free coloring pages from the books to try out. Hay you – lovely to hear from you – excitement round here is going through the roof!